Create high-quality models in no time at all with these comprehensive, full-color, techniques and tutorials from Antony Ward and David Randall. 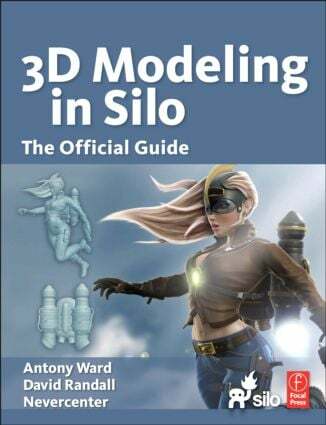 These step-by-step tutorials walk readers through the creation of a high-quality female model while teaching you the basics and principles behind 3D modeling in Silo - including modeling the face and clothes, creating textures, and posing the character. The companion website includes all of the tutorial and project files. This book is officially endorsed and co-written by the creators of Silo, Nevercenter. - See how to create three main models - A base mesh, a detailed female base mesh and the final cover character, Jade Raven. - Covers both organic and hard surface modeling techniques. - Introduces the reader to more advanced Silo tools like Paint Displacement and UV Mapping. - Full of bonus material and information to make you a more efficient 3D artist. - The techniques featured can also be applied to other 3D applications, making the skills you will learn easily transferable. - Get money off Silo with the discount code included. Since the days when stipple was king, Antony Ward has grown with the game development and computer graphics industries, adapting his skills to match its increasing thirst for polygons. During the past 14 years, Antony has led teams, developed workflows, and trained staff in some of today's leading game development studios, all while sharing new techniques as he did with his first book, Game Character Development with Maya and the eagerly anticipated sequel Game Character Development. His website is http://www.ant-online.co.uk/index.php. Nevercenter Ltd. Co. is a private company based near Salt Lake City, Utah. We are a small team devoted to the development of 3D software and content. Our goal is to make 3D graphics more accessible to a wider variety of people, with an emphasis on speed, appeal, and ease of use, while maintaining a high-end product. Their website is http://www.nevercenter.com.